Photographs are often very important sources of evidence used to prove a plaintiff's case. There are two things photographs can help prove - 1) liability, and 2) damages. Proving liability means proving that the defendant is at fault for your injuries and should be legally responsible for paying for your damages. Damages is a general term referring to what happened to you as a result of the incident (bodily injury, medical bills, mental anguish, pain and suffering, disfigurement, loss of a normal life, lost wages, wrongful death). Photographs are extremely important in premises liability cases, such as when someone slips and falls on ice. Just because someone slips and falls on someone else's property does not mean that the property owner is automatically liable for that person's damages. In Illinois we have to prove that the ice was an "unnatural accumulation," which was caused or aggravated by something the landowner did, or didn't, do. For instance, if it rains and then the rain freezes and a person slips on a sidewalk outside of a store, the store is probably not liable because the ice was a "natural accumulation." 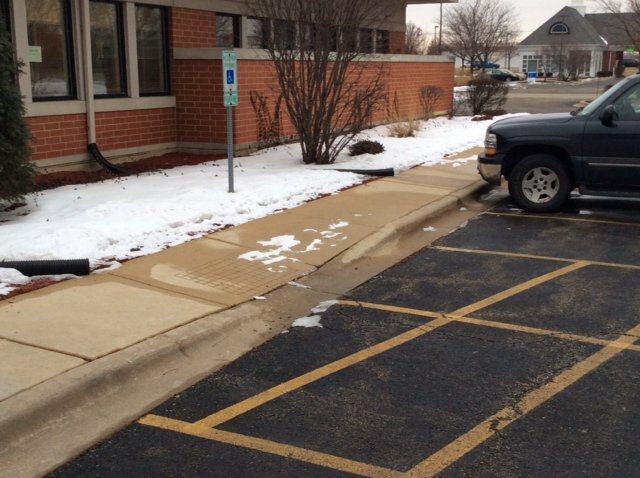 Now take that same situation, but add a downspout that ejects water over the sidewalk where the fall occurred - that water was directed over the sidewalk where it turned into ice. In this situation, the landowner is probably liable. Every attorney would rather have too many pictures than not enough. If you are injured in a slip and fall you should take pictures right away or have someone you trust go back to the scene of your injury to take pictures. Take a picture of exactly what caused your fall. Take a picture of the exact patch of ice that caused your fall (or other dangerous condition). Take the picture up close, take a picture with the flash, take a picture without the flash, take the picture from multiple angles. This picture shows two ice patches. This is helpful because it proves there was ice, but it doesn't help us prove how or why the ice formed there. Zoom out, step back, take pictures of the cause of your fall and the surrounding area. Now that you have a good up close picture of the cause of your fall, get a bunch of wider angled shots that show the surrounding area. This could be the sidewalk, building, and parking spaces around the fall or if you slip in a grocery store take a picture of the ceiling above, the aisle signs, the products on the shelves surrounding your fall, and include pictures of any security cameras that might have captured your fall. The picture above shows the ice patch that the plaintiff slipped on, but notice how it shows the area around the ice, too? This picture was the difference between winning and losing because it helped prove that the ice our client slipped on was an unnatural accumulation. 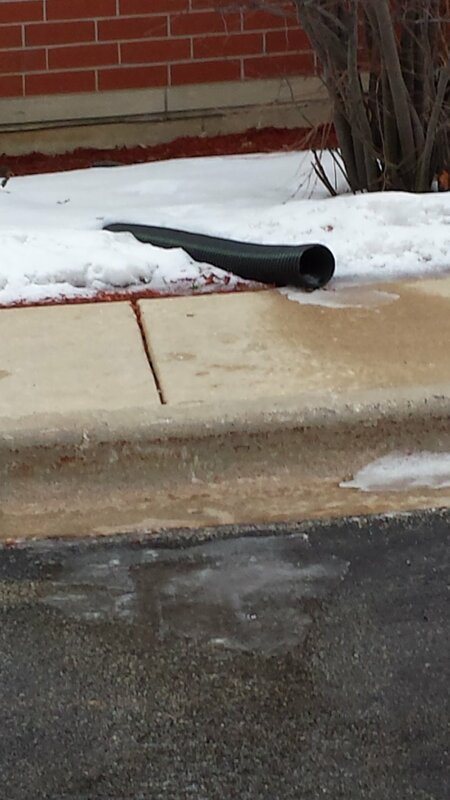 The picture shows the ice and a contiguous sheet of ice/moisture from the downspout extension to the ice that caused the fall. Finally, this picture shows where the dangerous condition was on the property. It shows the building, the parking spaces, and would generally allow someone to go to the property and identify the area where the fall took place. Take pictures...then take some more pictures. "I would rather have it and not need it than need it and not have it." Our attorneys find themselves saying this over and over again. The three pictures above were selected out of a group of 20 pictures. When we were contacted, the pictures were emailed to us and based on the pictures we were able to go to the scene of the fall and conduct a thorough investigation. Take pictures of your injuries right away. Pictures of bruises will help prove the trauma you suffered. A laceration that hasn't been stitched up yet is powerful photographic evidence for a jury to see. Create a photographic timeline of your injuries and how they heal over time. 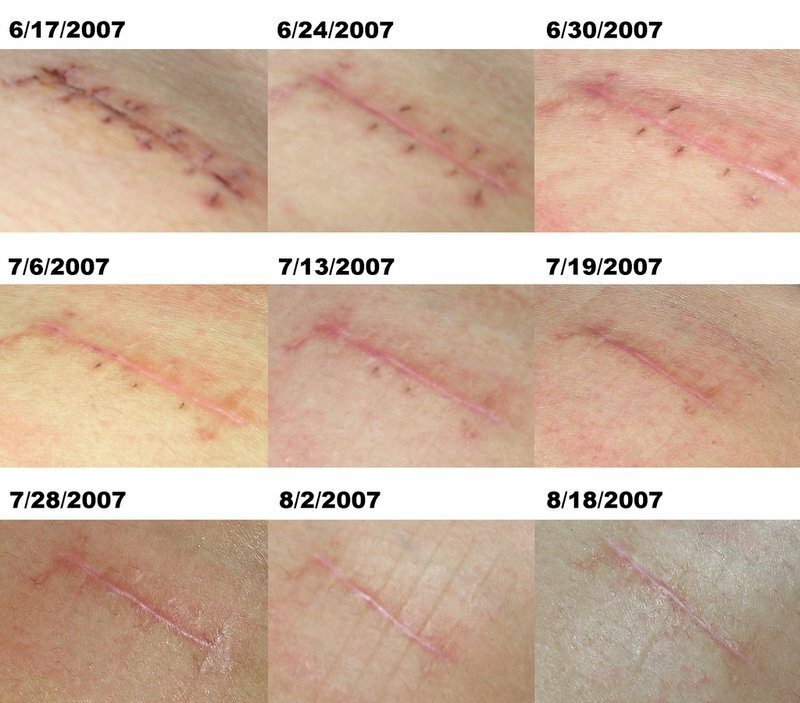 Even surgical scars should be documented over time. The pictures below show a good timeline/progression of healing - the only thing I would suggest to do differently is to take one picture close up of the wound and the same day take another picture that shows the wound and the rest of you so we know, and can prove, that the wound we are looking at was actually on your body. There is nothing worse than losing evidence as the result of a broken, lost, or drowned cell phone. Back your pictures up to the cloud, email the pictures to us at info@marker-law.com, email them to yourself...whatever you do, just back up your evidence. It won't save your life, but it could save your case. If you want to know if you took the right pictures, contact us today and we'll review them for you right away. There are a lot of attorneys in Illinois - finding a great injury attorney near you should be your goal. Please be sure to include the type of case.